Anyone can be initiated to Reiki and be attuned as a Level One, Level Two, Level Three or as a Master. 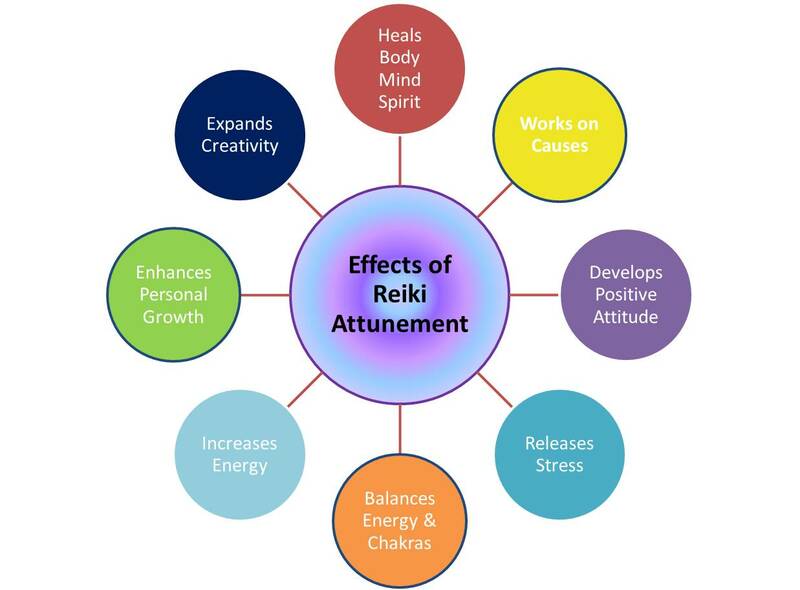 The attunement process enables the recipient to be permanently opened and connected to the Universal Reiki Energies on a Mental, Physical, Emotional and Spiritual Level. Each attunement receives opens the participant to higher levels of healing and knowledge. An attunement will help to clear any imbalances in the energy fields of the body (aura, chakra, meridians) to help kick start the body’s own natural healing process. The ability to learn Reiki is not dependent on intellectual capacity, nor does one have to be able to meditate. It does not take years of practice. It is simply passed on from the teacher to the student. As soon as this happens, one has and can do Reiki. It is easily learned by anyone. Reiki is not taught in the way other healing techniques are taught. It is transferred to the student by the Reiki Master during an attunement process. This process opens the crown, heart, and palm chakras and creates a special link between the student and the Reiki source. The Reiki attunement is a powerful spiritual experience. The attunement energies are channeled into the student through the Reiki Master through a beautiful and peaceful ceremony. The process is guided by the Rei or God-consciousness and makes adjustments in the process depending on the needs of each student. The attunement is also attended by Reiki guides and other spiritual beings who help implement the process. Many report having mystical experiences involving personal messages, healings, visions, and past life experiences. Once you have received a Reiki attunement, you will have Reiki for the remainder of your life. It does not wear off and you can never lose it. While one attunement is all you need for each level to be attuned to that level, additional attunements bring benefit. Experimentation has found that additional attunements of the same level (refreshers) add to the value of that level. These benefits include refinement of the Reiki energy — increased strength of the energy, healing of personal problems, clarity of mind, increased psychic sensitivity, and a raised level of consciousness. As a teacher I have seen my students many reactions to the process of receiving an initiation. In varying degrees each student has been touched in some special way by Spirit. Initiations are a part of the process of a reconnection to Spirit and a beginning of a new or renewed walk down the path of life. Many doors are opened in this sacred ritual. If you have received an attunement to Reiki, remember back to the feelings you had during your special ceremony and connection to Reiki. If you are thinking about taking a Reiki class, then know that the healing energies that you were born with will only expand as Reiki begins to flow through your body, soul, and spirit. I teach four levels of Reiki attunement. Click the level you are interested in learning about. Reiki Level One – for practice on your family, friends, pets, plants, food, water and the environment. Students learn about energy, how to open to allowing it to flow through them, and how to direct the energy to themselves or others for a healing. Reiki Level Three/Master – for attaining the rank of Reiki Master (Reiki 1 and 2 are a prerequisite). Students learn the Reiki master symbol, special healing attunements to give their clients and other Reiki symbols to enhance their abilities and to target specific issues.